I have two main bags, both Eagle Creek. There’s not much difference between the two–other than one is larger and must be checked. I bought the larger one specifically to hold both Kris’s and my walking sticks and my camera tripod. There are times when you just can’t carry on. This is the bag I’ve been carrying for about four years now. It’s small enough for carry on. It’s light and yet it’s damn near indestructible. It’s got reinforcement at all the edges. It’s made from a rip-stop material that’s light and strong. The wheels have survived being dragged over every surface from concrete to sand to gravel to cobblestones. It has a few thoughtful touches I really like. It has long soft zipper pulls. There’s a small outside pocket that makes an easy stash place for all the stuff you can’t carry on, such as my little pocket knife, when I need to check the bag. It also has a zip up compartment that covers the retracted handle to protect it from the rough handling the airlines dish out. And it has handles top and bottom, on the side, and on the top. Whichever way you want to grab it, it’s convenient. I also like that it comes in various colors. Mine is orange, which makes it easy to spot when it comes off the baggage carousel. The larger one is bright blue, like in this picture. I just had the main zipper repaired (for free, because of the wall-to-wall Eagle Creek lifetime guarantee) and the repair shop man told me he thoroughly checked the entire bag and found nothing amiss. That’s durability. 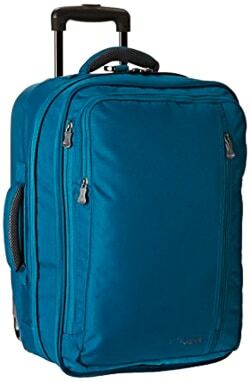 This essentially the same bag as above, but bigger. I haven’t used it as much as the smaller one, because I haven’t had to carry the walking poles for a while, and I can strap the tripod onto my camera bag and sweet talk them into letting me carry it on. I usually take this bag when we’re on driving trips. Frankly, it allows me to be a lot less picky about what I’m packing because there’s so much more room. Two great things about these Eagle Creek packing cubes. They’re ultra light and they’re durable. It’s that simple. I’ve had my set for about four years, and despite their apparent flimsiness they’ve held up fine. I use the largest one for underwear. The middle one is for socks. And the small one is for random other stuff such as my spare glasses, toothbrush, etc. Don’t overpack them though, because you can pull off the zipper. The toiletry bag is made of the same material as the packing cubes. So again, ultra light. I have two of them-one for my toiletries and one for my vitamins, medicines, etc. This is my everyday briefcase, and my “personal item” for carry on. It is light and very durable. It has separate compartments for my laptop and my tablet, and the usual briefcase inside pockets for pens, business cards, and other miscellany. The best idea, though, is an inside pocket that’s exactly passport size. I also like the outside pocket that is just under the flap. That makes it very handy for dumping out the contents of your pockets as you go through airport security. 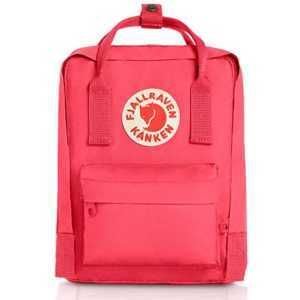 This is my day pack. It is primarily designed for biking. (I do a lot of biking when I’m home in the US.) It has a little tool kit pouch in the bottom pocket where I carry my bike tools and a dedicated clip apparatus for my helmet. I’ve attached a couple of carabiners to it for fixing my walking sticks when I use it for day hiking. It’s small and flattens nicely, which means it can be packed within my suitcase. Even though it’s small, it has room to carry an extra lens for photo expeditions. 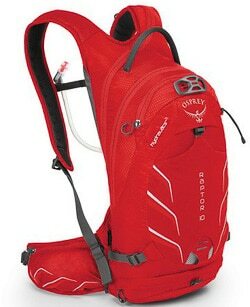 Of course, it has a built in 3 liter water pack, which I rarely fill all the way. But it’s good to know the capacity is there for a long hot day. There’s a woman’s version, fitted for a woman’s body, too. The newest weapon in my arsenal of bags is my Fjallraven Kanken Mini Backpack, which is both my purse and daypack for all but the most active travel. 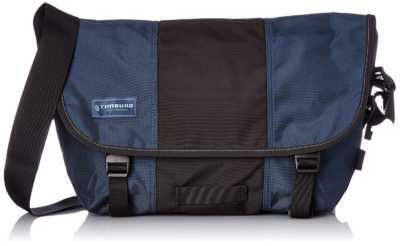 I call it my city bag as opposed to my hiking or biking pack. The fabric feels like a waxed canvas (it’s called Vinylon) and resists water and dirt. I like that it takes on a nice patina with use. The secret ingredient is a foam pad which slides into an internal pocket. It serves both to keep sharp edges from poking into your back and, when removed, makes a great little seat for resting on damp ground. The open side pockets will handle a small water bottle, keys or a phone, though I zip those items and my passport inside when need be. This little bag holds a lot-including half my office and all my airline reading and accessories–while sneaking through apart from my carry-on. 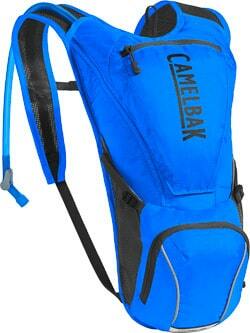 For serious day hikes, I try to stay with my petite Camelbak pack. 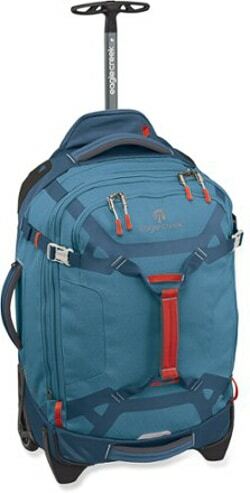 Its hydration system is just 1.5 liters, and the zip pockets for snacks and keys are really small. But with an external pouch that can be cinched with straps, and by adding exterior capacity with carabiners, I can manage to make it work. My version seems to be smaller than anything on the market today. 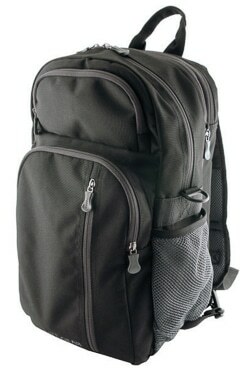 It’s small enough to pack in my roller bag, and offers really comfortable shoulder and waist straps. This is an updated version of a post originally published in 2017.